Lelant Villa is one of my absolute favorite villas. It sits right on the Royal Westmoreland Fairway, it’s got a well-stocked bar, and the pool is amazing. Royal Westmoreland is a great location because its gated and has resort amenities. Plus, the villa comes staffed with a cook and a housekeeper. 5 minutes away from Mullin's Bay! 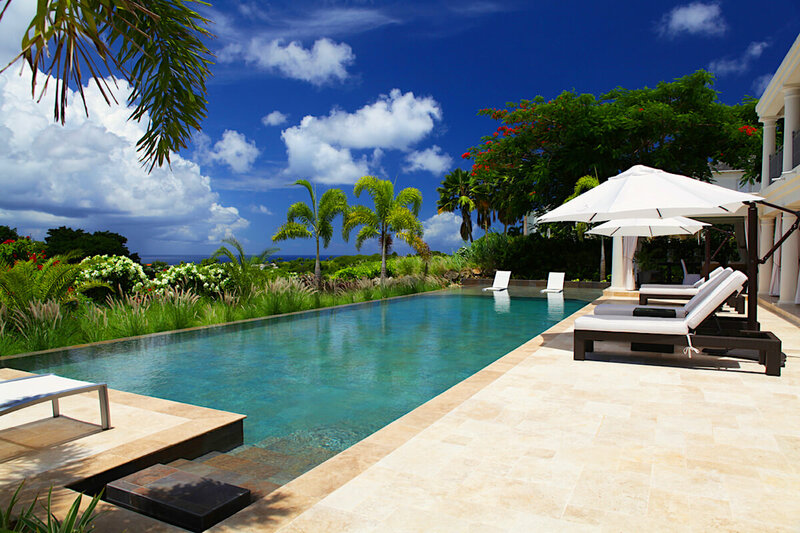 Lelant Villa is a stylish and modern villa next to Royal Westmoreland Golf Resort’s 16th fairway. Guests at this luxury property will be pampered not only by the cook and housekeeper, but also by the five-star amenities inside and out. Guests at Lelant have exclusive access to Royal Westmoreland Beach Club, which is located five minutes away at Mullins Bay. Snorkel and swim with vibrant tropical fish and turtles under the turquoise waters, or relax on the warm, pink sand. Royal Westmoreland offers free shuttles to Mullins Bay and Bell Captain service on the beach. Lelant’s covered patio has comfortable seating and an al fresco dining area, and is just steps from the infinity-edge pool. The pool’s wading area has a gentle slope and in-pool loungers, and there’s a water garden in the courtyard for more private meditation. The patio leads into the fully air-conditioned living room. The gourmet kitchen has access to the dining area, stainless steel appliances, and expansive countertops. This level also has an air-conditioned family room with a TV and a wet bar. This level’s two bedrooms surround the water garden and have ensuite bathrooms. One is a king suite and the other is a queen suite. On the upper level, there’s a master suite with a covered balcony, an ensuite bathroom, and a king bed. The fourth bedroom is located in a separate cottage and opens to the pool deck. It has a king bed and an ensuite bathroom. There’s also a children’s suite with two twin beds that can only be accessed through one of the main house suites. All four bedrooms are air-conditioned. Royal Westmoreland enjoys 24-hour security, a golf course, tennis courts, a fitness center, and a clubhouse with a pool, dining options, and beach facilities. Lelant is a short drive from fine dining, shopping, and activities along the west coast. 5 minutes away from Mullins Beach and Bell Captain beach with free shuttle service. Golf and Social Membership – Guest can access the Royal Westmoreland championship golf course. Membership also includes access to the sanctuary pool, beach club at Mullins, tennis courts and club house.